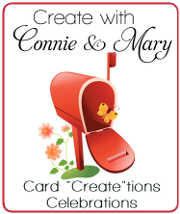 I have been having so much fun playing with the What’s Your Type set…there is just so many different things you can do with this set. I saw that the CAS challenge is to do a masculine card and so since I had this set sitting out on my desk I thought I’d just go with this for the card today. I’ve also been using my Candy Dots a lot recently so thought that would be a fun add on for this card. 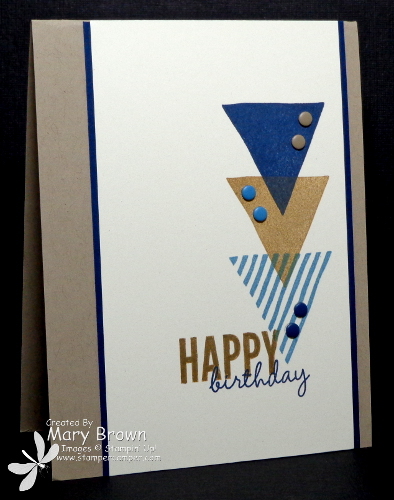 Very Vanilla – 3 1/4 x 5 1/2, stamp solid triangle using Night of Navy and Baked Brown Sugar, stamp striped diagonal triangle using Marina Mist. This entry was posted in Challenge, Clean and Simple (CAS), Spring Mini and tagged Celebrate Today, What's Your Type. Bookmark the permalink.